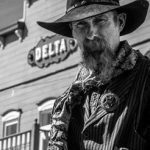 We specialize in authentic frontier and old west men's clothing, including western frock coats, fancy western shirts and work shirts, old west hats, men's pocketwatches and other necessities. By shopping with us, you can be assured of authentic clothing, affordable prices, and genuine customer service. I am involved in Cowboy Shooting and Historical Emporium has a very large selection of authentic western style clothing. The web site is easy to navigate and delivery was prompt. Will do business with them again.